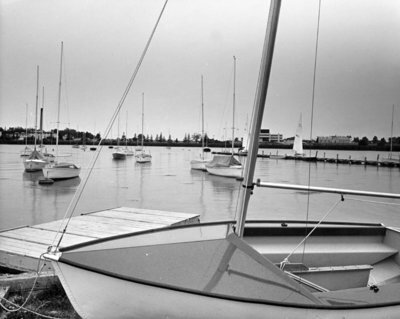 A black and white photograph of sailboats at the Whitby Yacht Club. The Whitby Yacht Club was officially created on January 28, 1966. The provincial charter was issued to the club on November 14, 1967. The charter members of the club were Melvin D. Goreski, John R. Vickery, Jack D. Blucher, Tom J. Farquharson,Walker Douglas Clark, Larry Cond, William Goverde, Lee Hart, Harold Price and Jack Veitenheimer (Ed McPherson, The Whitby Yacht Club, (Whitby: Whitby Yacht Club, 1992) 16-17,83). Whitby Yacht Club, Date Unknown, Photographer Unknown. Whitby Archives A2013_010_001. Scanned from black and white photograph.